Hey everyone. 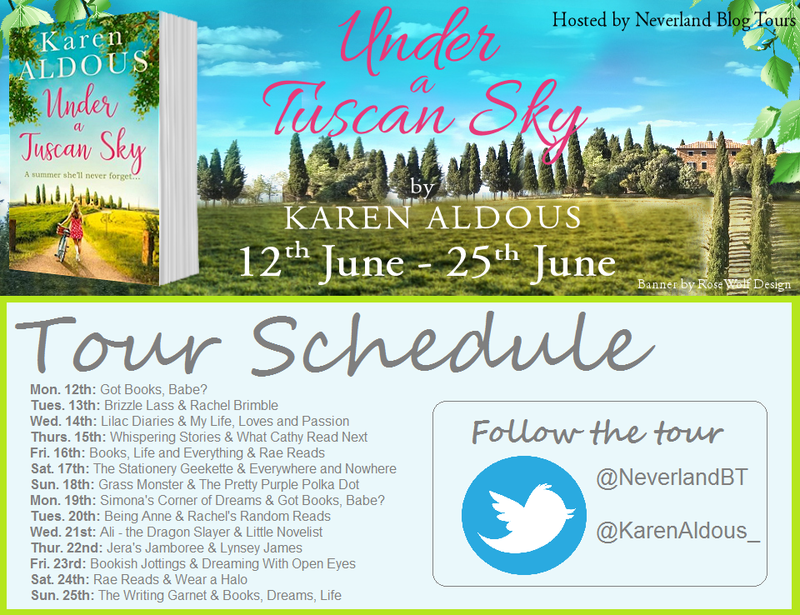 Today I have an extract for you for the novel Under The Tuscan Sky by Karen Aldous. It was so much more than an image. Olivia Montague’s finger stroked the ageing photograph of the elderly couple gazing, not at the camera, but intensely at one another even after all those years. And even in sepia tones, glints of love and passion sparkled in their eyes. Olivia’s skin prickled looking at them standing huddled among the vines, their chemistry radiating from the now dulled, once glossy paper almost as if it were present in her Bermondsey sitting room. More significantly for Olivia, her Italian grandparents represented family – solid, the roots of her being, an impenetrable foundation. Nonna Elena and Nonno Angelo had such adoration for each other, just like her mother and father in those brief years before her father’s death. She picked up the other photograph her mum had given her just before Nonna’s funeral. The one in colour, two sunburned hippies blazoning sun-bleached hair against a lapis blue sky and pink sand, eyes lost in one another. So much longing and love dazzling between them. Sadness gripped Olivia’s throat. Was it real or was she imagining it? Was it an Italian gene that had by-passed her? Why couldn’t she have that love? She and Will Parks had never looked at one another like that. Lowering the image, she glanced up, her eyes seemingly fixed on wooden shutters encasing the bay window, but they stared vacantly, imagining the inscription on her headstone. In her mind a sinkhole appeared, a huge void spreading fifty feet or more on a wild meadow splashed with blue crocuses and daisies. Sliding into it was Nonna, Nonno, her mum and dad, her gran, grandad, Will. Then her. She lurched violently forward then quickly grabbed a long twine, then clutching tufts of long grass and a thread of tangleweed, she scrambled on her knees to save herself. On her knees on the bank, she twisted herself reaching out in the hope one of them would be close enough to pull her to safety. Instead she watched each slowly sink into the blackness, tumbling in different directions, not one of them reaching for her. It was a nightmare imitating life, reinforcing the abandonment she constantly felt: that hollow space she’d locked inside her that no one could or would want to fill. Even Will. The image played repeatedly during the night and the following morning whilst she was on her run. As she was drinking cold water and black coffee in Starbucks afterwards, her phone pinged. A message from Will saying he would be back from football about seven. A sigh escaped her as she slid the screen back and stuffed the phone back in her pocket. At the tables surrounding her, young couples and family groups seemed to be looking on with pity. ‘Of course I have a life,’ she screeched under her breath, pulling out her phone again and willing it to ring and hitting Chiara’s number when it didn’t. It went straight to voicemail. The problem was, the only people she could talk to about the photos just weren’t available. Like most Saturdays, there was no Will to hang out with until later, much later, and when he was still likely to be in his football coma. Her friend Chiara would be taxiing Sophia to some activity or other. Olivia felt she would really value another opinion right now. But no other friends knew her as well as Chiara. It was times like these when she really wished she had someone else close, particularly family, but unless she counted a runaway hippy mother somewhere in northern Italy, she was on her own. Their last tête-à-tête ended in tears after she’d asked for help with – and invited her mother to – her Granny Nora’s funeral. Not only did the inebriated Roz tell her to pull herself together, but she also refused to come on the grounds that she’d barely known her, and couldn’t even bring herself to send a spray of flowers. Sometimes she just wished her mum could be a proper mum and at least offer a friendly ear when she needed one. She swore the woman didn’t have a heart. Olivia’s mood was sinking. She folded her arms, hugging them in to support herself. 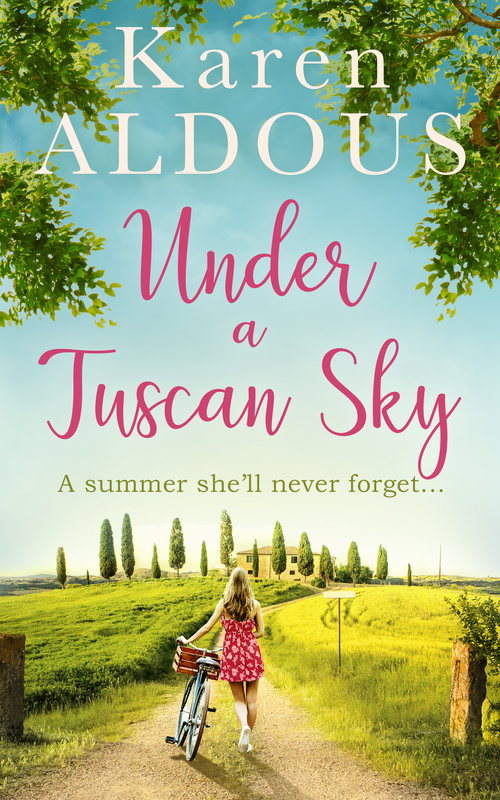 Maybe staying at Nonna’s villa in Tuscany without Will would give her some space, a proper chance to deal with her grief, and maybe, clearing out the villa would give her the opportunity to discover more about her nonna and her mum. It was their home, and the place where her mother grew up. An insight into a woman who could abandon a child and then thrust responsibility for both grandmothers’ funerals and property on that child could prove interesting. Trying to muster up enthusiasm for the dreaded task of sorting through Nonna’s things, Olivia opened her phone and tapped on to the newly created schedule for ‘Trip to Italy’, on her Diary app. There was so much to fit into eleven days and if Will was adamant he couldn’t make it, she had double the workload.